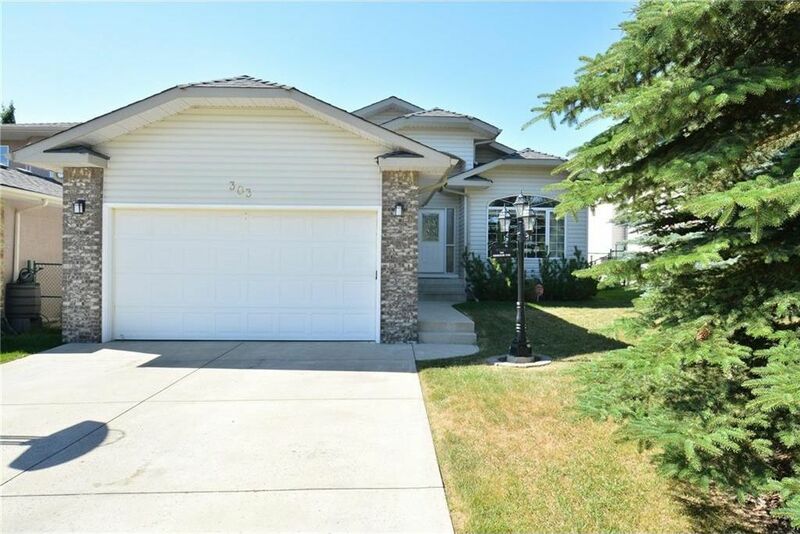 Welcome to 303 Gleneagles View in Cochrane AB! Looking for an upgraded walkout bungalow with majestic mountain views, open floor plan, main flr den (with views) & access to tons of walking paths in a Prov. Park? THIS IS IT! Backing on a golf course, with no homes directly behind, close to a playground, on a quiet end of the street. Step inside, and be welcomed by the rich, site finished hardwood floors, 9 ft knockdown ceilings, freshly painted interior and big windows that bring the outside in. A formal dining rm/den is at your right, while the central, spacious island kitchen is adorned w/ granite counters and opens to a sunny nook w/ raised eating bar & living rm w/ focal 3-sided fireplace. A 2nd den offers great views, and a good sized master w/ 4 pce ensuite beckons you to wind down at the end of the day. Main floor laundry hook-ups + a full laundry rm down for flexibility. Fully developed walkout lvl with gorgeous built-ins, 2nd fireplace, cork flooring, 2 extra bedrms, full bath & infloor heat! Additional items / features: New roof approx. 2 years ago, one h/w tank replaced approx. 2012, fully fenced & landscaped, large deck with duradeck, aluminum railings & glass panels, dbl front attached garage w/ driveway plus tons of street parking, lower patio area, cornice molding & dbl french doors in dining/den, gas line for BBQ, partly covered deck, skylite in master ensuite.